IFTN caught up with Irish actor Damien Molony to discuss his new Sky Comedy Series ‘Brassic’, how he got started in the industry and the buzz of coming back to Ireland. 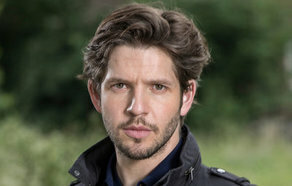 An actor of stage, TV, and film, Damien Molony is best known for his television roles as Hal in BBC’s 'Being Human', DC Albert Flight in BBC’s 'Ripper Street' and DS Jack Weston in 'Suspects'. Born and raised in Johnstown Bridge in Kildare, Molony attended Trinity College from 2003 to 2007 where he obtained a degree in Business and Political Science. He began his acting career in 2007 touring Ireland with the Balally Players in 'Riders to the Sea', for which he was nominated as best actor in the One Act Drama Festival. Damien attended Drama Centre London from 2008-2011, graduating with a BA in acting. While at drama school he performed in several theatre productions and played the male lead in award-winning short film 'When The Hurlyburly's Done'. After being spotted in his drama showcase, he was offered the part of Giovanni in John Ford play ''Tis Pity She's a Whore', which ran at the Yorkshire Playhouse. While appearing in the play, he auditioned for and landed his first leading television role in BBC supernatural drama 'Being Human'. Molony appeared in every episode of series 4 in 2012 and series 5 in 2013 as Hal Yorke, an over 500-year-old vampire. Molony recently attended Sky’s 2019 Content Showcase at The Westbury in Dublin which previewed some of the up and coming series to watch out for this year, including Riviera, Chernobyl, and Temple (written by Mark O’Rowe). IFTN also caught up with Chernobyl star Jessie Buckley. The series follows a group of working-class friends finding unconventional ways to win at life in northern suburbia. Vinnie (Joseph Gilgun), a Lancashire lad with bipolar disorder, and Dylan (Molony), his razor-smart best mate, are inseparable and utterly co-dependent. They've hardly spent a day apart since birth. But Dylan's girlfriend Erin (Michelle Keegan) might just shake things up for good with her plans to leave town and start a new life for herself and her kid, Tyler. IFTN journalist Nathan Griffin caught up with Damien to find out more about the upcoming series. IFTN: Can you give me a little bit of background into how you first got started in the industry? IFTN: How did you get your first major break – Was it an Irish or UK show? IFTN: I'd say you always relish the opportunity to come back and work locally? IFTN: How did the opportunity to get involved with Brassic come about? IFTN: For people who might not know much about Brassic right now, what could you tell us about it? IFTN: The show looks incredibly funny. I imagine it was quite a fun set to work on? IFTN: One ‘Brassic’ scene shown by Sky at the launch saw your character, Dylan, share an unflattering romantic scene in a port-a-loo with his love interest Erin, played by Michelle Keegan. How do you prepare for a scene like that, especially when you had only met Michelle for the first time early that same day? IFTN: What other projects do you have coming up that you can tell us about? ‘Brassic’ airs on Sky One and NOW TV later this year.